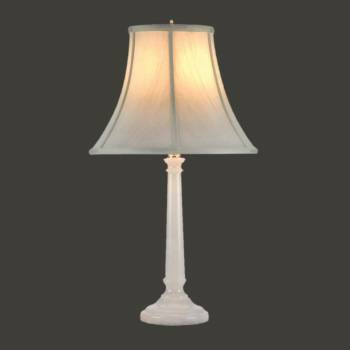 Table Lamps: Renovator's Supply's Thin Table Lamp are crafted from Alabaster quarried in Spain. This lamp measures 22 in. high x 12 in. wide and has a 4 1/2 in. diameter base. The beige hand sewn shades measures 12 in. wide x 9 1/2 in. high & the top diameter is 6 1/4 in. and comes with urn style finial that is solid brass.